The Ohio Nature Blog: There She Blows! Like most young people interested in biology from an early age, marine mammals always grabbed my attention. If you like nature, I'm not sure how they can not. I got my marine mammal fix by working at Sea World of Ohio as a teenager. It's not there anymore, and that isn't necessarily a bad thing. 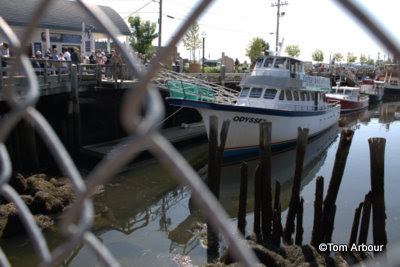 one of the best ways to see whales from southern Maine is a berth on the Odyssey, a whale watch vessel that sails right from the Old Port. Which brings us to Portland, Maine. If you've never visited, it is one of the east coast's little big cities. A major port, it boasts a mix of the very old and very new. 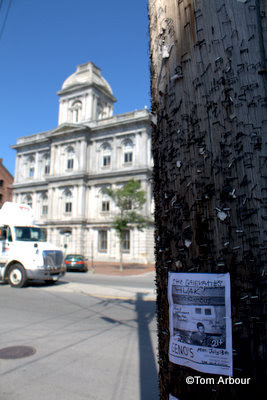 The picture above is of the US customs house, built in 1874. It is one of my favorite buildings in Portland, and I can't seem to photograph it enough. 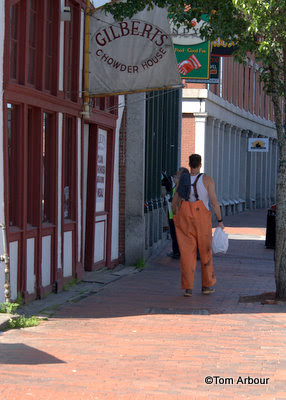 Portland is ultimately a port city, and the seafood that can be had along the old port is fresh and delicious. It is captured daily along the coast by people like this man, heading down to the docks to begin a day on the water. The dock along which the tour boats park was full of people on this Friday morning. I'm glad Megan and I had a reservation. Several other people were taking harbor cruises rather than the four-hour whale watch. In my opinion, you get your best bang for your buck with a whale watch. Built in harbor cruise, sea birds, and whales. What more could you ask for? 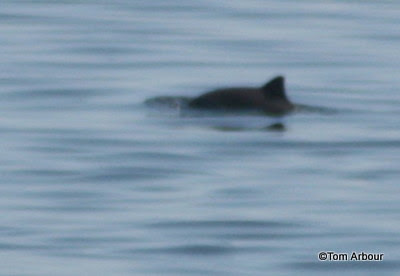 Two harbor porpoises, Phocoena phocoena, a mother and calf. 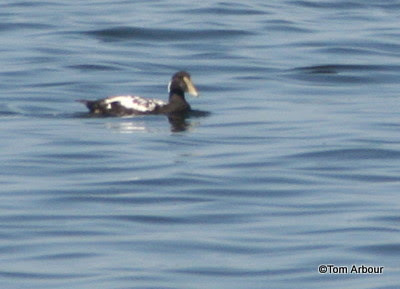 Several common eiders, Somateria mollissima. Then, finally, after two hours heading straight out into the Atlantic Ocean, the blow of a finback whale, Balaenoptera physalus, the world's second largest living animal, ever. And not only one, but two, a mother and her 30 foot long calf. These animals are amazingly long- the woman's head in this shot provides great scale. And that was our whale watching experience on the Odyssey. If you're in Portland Maine, I'd recommend it highly. $45 gets you a four hour adventure, full of whales, porpoises, pelagic birds, and the sights of Portland Harbor. This is my contribution to the July 18th edition of "Camera Critters"
I want to go back to the ocean! I love your photos of the whales and would love to see them. Sounds like we need to head to Portland, Maine. With the eider, shearwater and a gannet all the the better! Wonderful, educational post. Loved all the photos. Traveling and critters ... can't beat that! Thanks. I agree, the whale-watch cruises are well worth the price. I took one out of Provincetown, Cape Cod, years ago, and still feel a sense of awe about these stupendous creatures who seem to enjoy relating to us. Rather than fleeing from our presence, they actually gathered around, swimming alongside the boat, so we could really see how huge they were. Great photos of a spectacular cruise. How exciting to see whales, plus all the other critters. We have little whale and shark watch days here, but we are talking little ones out at sea. Great write up ans series of images but I am just mesmerised by the wave. What a great trip! Must've been amazing to see such a huge whale of a whale! And great pelagic birds you photographed as well. Wonderful shots! Looks like a very fun day. 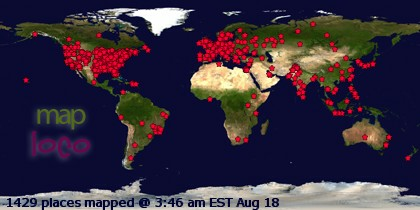 Tom: What a neat show from the great state of Maine. That was a great set of critters. This makes me want to go to Maine! And I agree with you that the whale watch seems to be a great value with all that you get to see on the way out, plus the whales. I went once as a girl when we vacationed in Boston. It was awesome! Wow...how wonderful to see a mother and calf both. Some great shots! I love that shearwater photo in flight. I did a "whale watch" trip in the islands up by Seattle once...it was Orcas mostly, but we did see one grey whale. Whales are really magnificent creatures. You don't realize how big they are until you see them! I still regret that we didn't get to take the whale watch trip out of Bar Harbor because of the weather. Remember that? We took a short ride around the harbor, but that didn't compare to what you just showed. Maybe we'll still do it some day, I hope, from Portland! Kelly- It is a great place. I'm about to give you more reason to go there, stay tuned. Snap- You are certainly welcome. Jackie- Awesome. I wished I had polarized sunglasses to see the whales better through the water, because they were quite close to the boat as well. Janie- Thanks very much, the whales were great. Babooshka- I'd like to try your whale watch trips as well. Thanks Adam- My crappy sigma zoom left me longing for some Canon "L" glass. Thanks Brooke, we did have a great day. Tom- It was definitely fun. Adrienne- I think you'll really enjoy Maine. There is no place quite like it in the U.S.
Mary- I'd really like to go see Orcas as well, I think that would be spectacular. Mom- Yes, I definitely remember it. We could all plan another trip to Maine if you want. Let's talk.